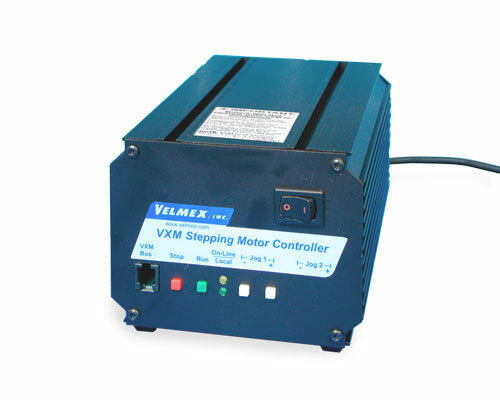 Velmex offers several VXM Stepper Motor Controllers to govern the performance of the motors available for Velmex products. They make precise positioning of the slides, stages and tables simpler and more effective. 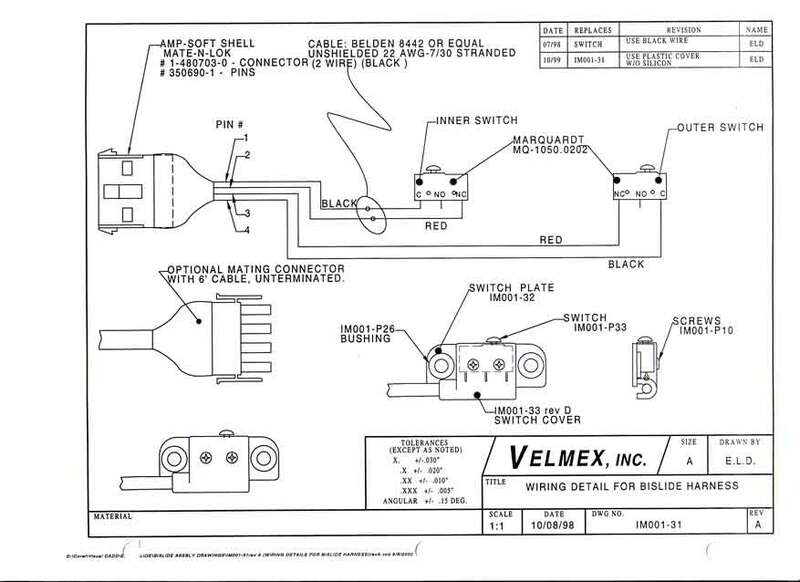 Velmex VXM Controller Systems are components that drive motorized Velmex products including UniSlides®, BiSlides®, XSlides™ and Velmex Rotary Tables. 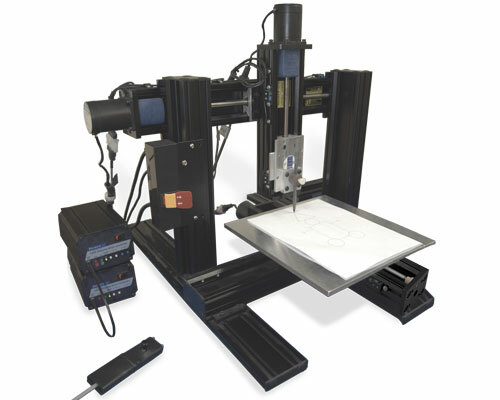 The VXM's advance design delivers high, consistent performance and insures they are very efficient, reliable and easy to program. 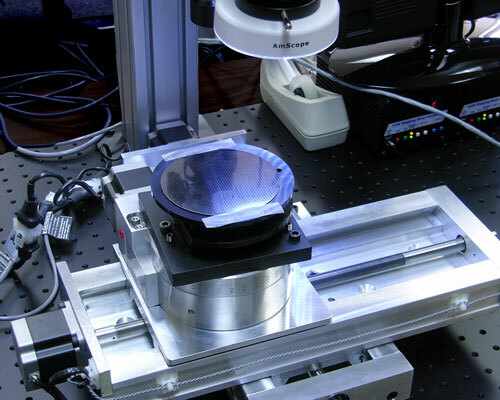 Velmex pioneered the development of a microprocessor-based indexer/driver controlling one, up to four axes in a single system. This 2-phase, unipolar stepper motor controller has the capability to drive and control precise movements, multi-axis and velocity. 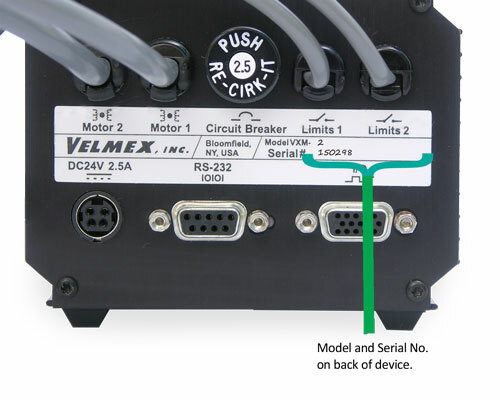 Velmex's VXM Controller System is capable of controlling to 4 motors, 1 motor at a time. Also two motors can be controlled simultaneously for coordinated motion. 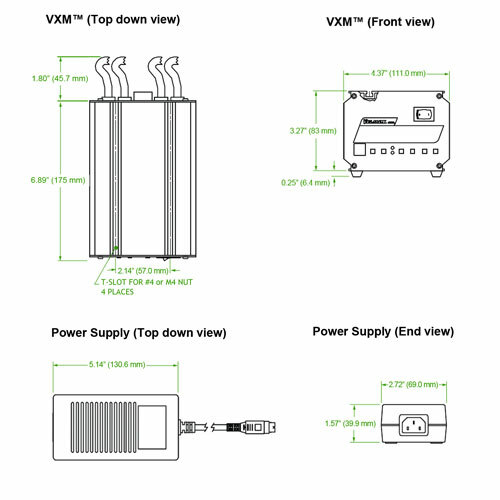 Velmex VXM Systems can be used with a PC, Tablet, Laptop or PLC or can run standalone. 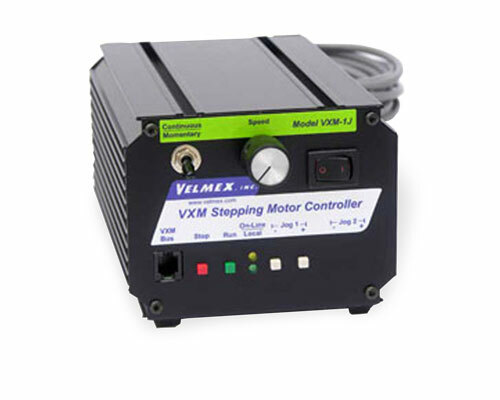 Velmex also offers a simple, variable speed and teachable two-move version of the popular VXM™ series of step motor controller systems. 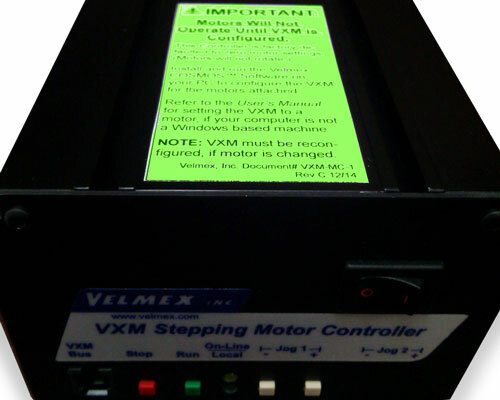 The VXM Controller uses a half-step switching sequence to drive the motor. It has a programmed look-up that maximizes the motor torque. It constantly is optimizing the efficiency of the motor and therefore, doesn't lose torque. This delivers higher resolution and lowers the noise and susceptibility to motor resonance. 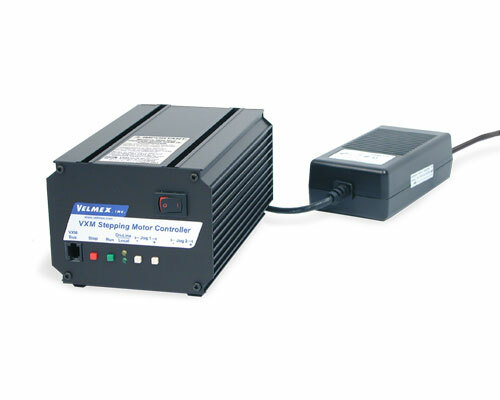 Velmex VXM Systems enable the step motor to operate more efficiently by utilizing pulse width modulation current control, with an automatic motor power-down for lower power consumption. The system's microprocessor is in total control of the voltage level on each phase of the motor drive which eliminates the noise interference. 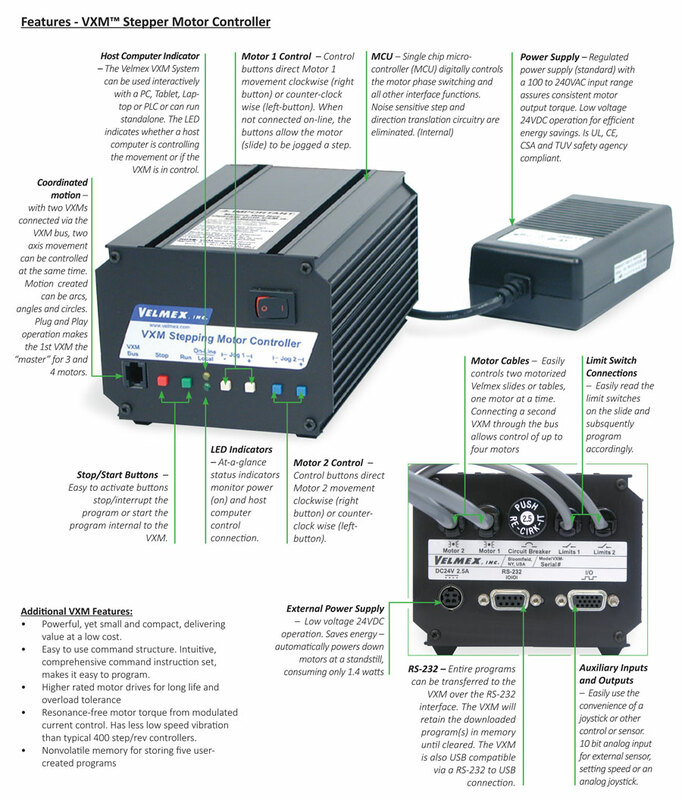 VXM-1 (standard) – A single-axis programmable control and driver for one motor. VXM-2 – Controller for two motors (2 axes), one at a time. VXM-3 – Controller System for three motors (3 axes), one at a time or one motor from each box simultaneously. VXM-4 – Controller System for four motors (4 axes), one at a time or one motor from each box simultaneously. VXM1-1 – Controller System for two motors, one at a time or simultaneous motion of 2 axes. 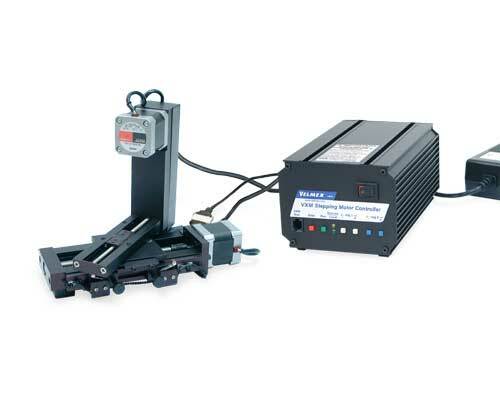 Above versions also available with a brake – useful in systems where you are trying to control a vertical axis. 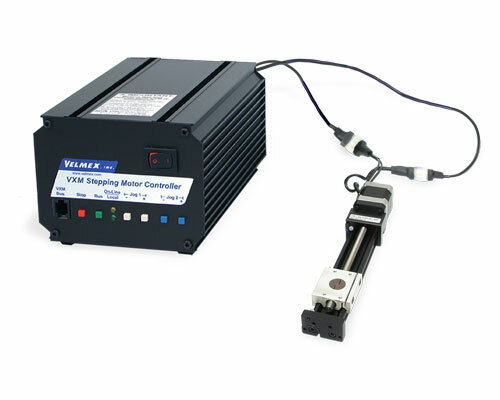 VXM-1J – Enhanced jog and auto-reverse single motor controller – 1 axis only for directing motion between two points. Programmable front panel – no computer needed. Speed is adjusted with a potentiometer. VXM-3 3 motor version, one motor operates at a time or one motor from each box simultaneously. 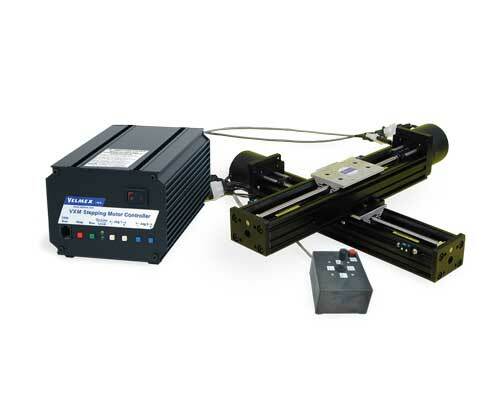 VXM-4 4 motor version, one motor operates at a time or one motor from each box simultaneously. VXM Controllers have serial numbers which can be located on the back of the device. 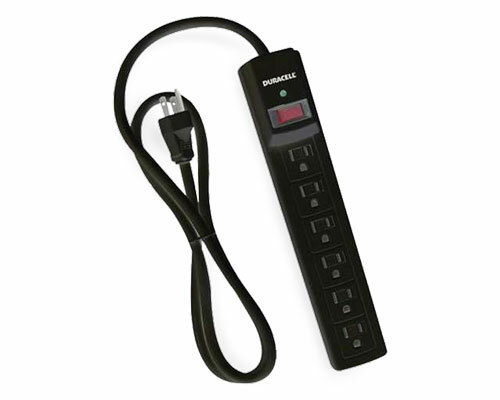 Power Supply - The universal power supply is standard with all VXM Controllers. It can also be ordered separately. 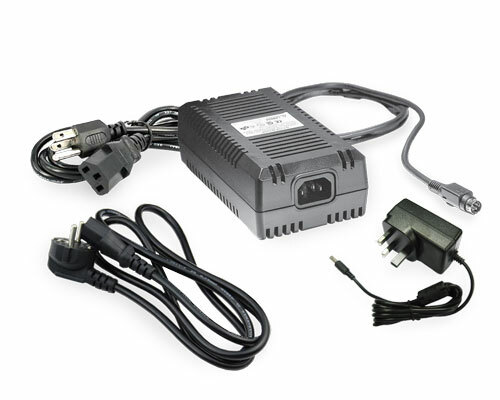 - International compatibile versions of the power supply also available. 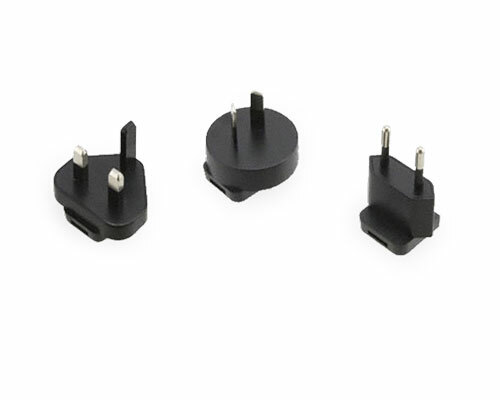 International Adapters – Adapter plugs for the power supply. Joysticks - Direct the VXM Controller with use of a joystick. 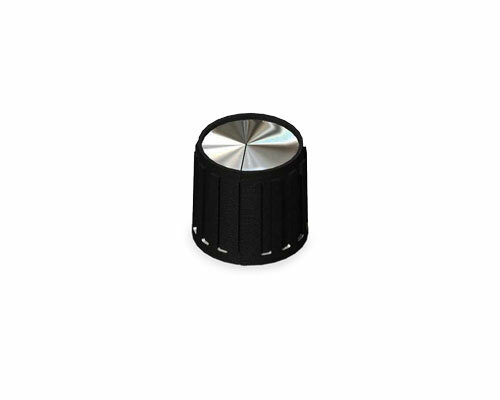 Digital Joystick - allows remote jog control of a one or two axis VXM controller. Analog Joystick - derives speed (velocity) and direction from joystick position. Heavy duty 2-axis joystick - controls two axes. For more robust commercial/industrial applications. 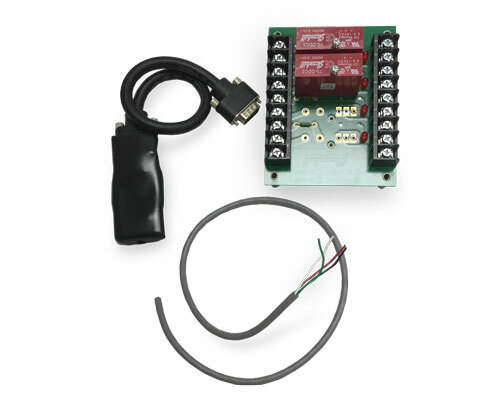 Heavy Duty Remote Jog Station - The Jog Station remotely moves (jogs) a single axis VXM-1 or VXM-1J Controller via push buttons. It offers convenient one-hand operation. 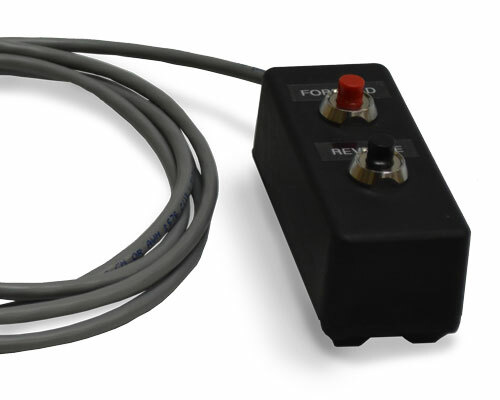 Foot pedal – used to direct the Controller to jog or run. 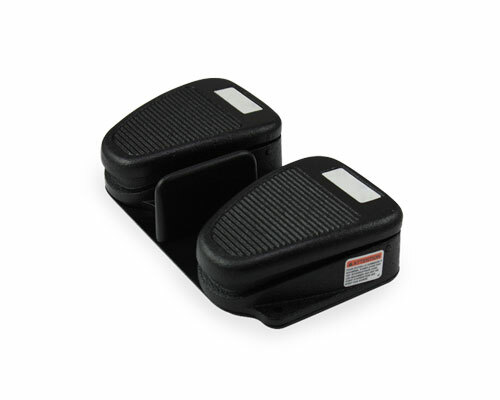 Single-button (pedal) and dual-button (pedal) available to start/stop or jog/run. 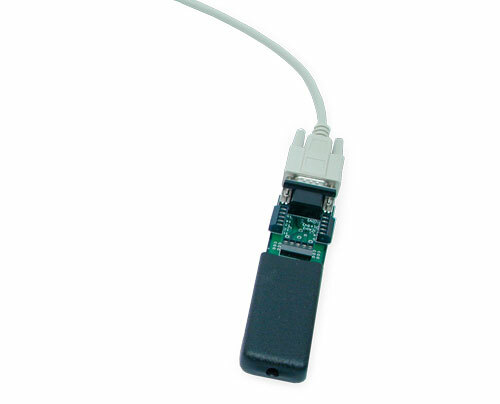 I/O Splitter – The I/O Splitter allows both a joystick and the Auxiliary I/O Breakout Module to be connected to the VXM at the same time. 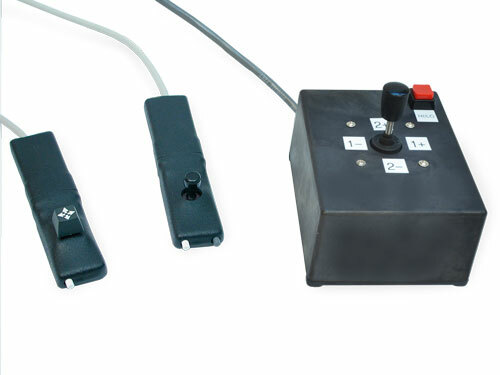 Thumb wheel – Thumb wheel program selector switch allows you to easily select and switch between programs loaded in the VXM. The VXM will store up to 5 programs. Auxiliary I/O Breakout Module – The Breakout Module is a convenient method to interface to the VXMs auxiliary I/O. For more details see VXM Interface Modules. 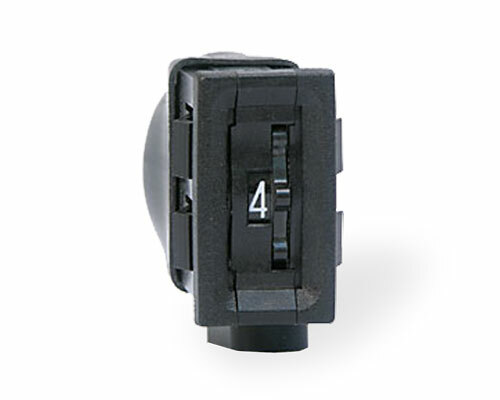 Relay Modules – Relay modules with 2 or 4 outputs function as a dry contact switch. AC or DC versions also available. Speed Pot – To control speed at the VXM. 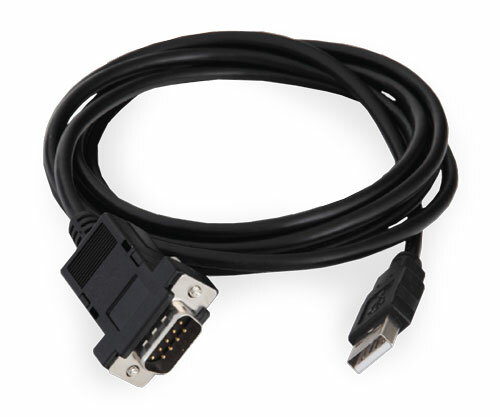 Communication Cable – The communication cable (USB to RS232) allows the VXM Controller to communicate with the computer. 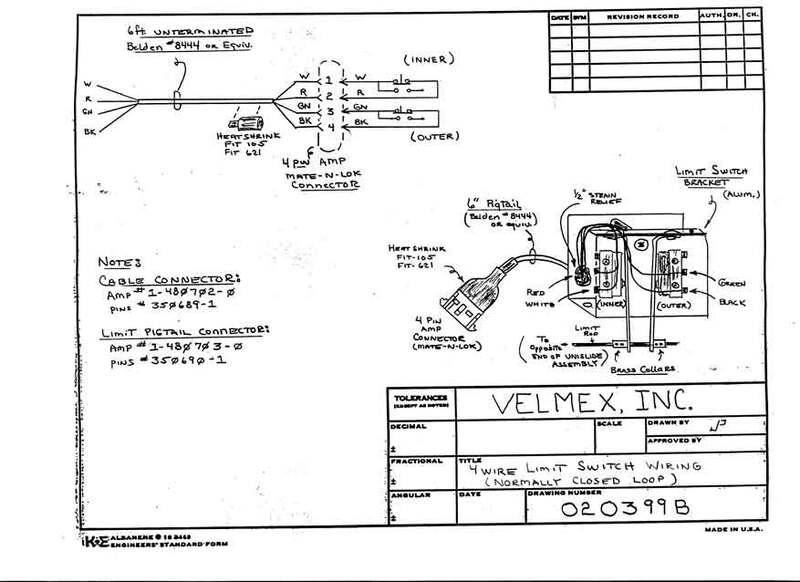 (10 ft. long) The cable provided by Velmex has LED indicators to assist with troubleshooting. 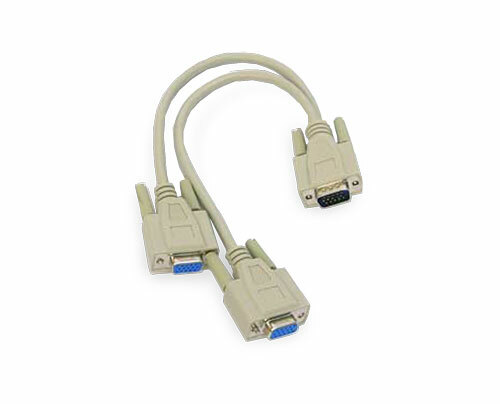 Bus Cable –To connect to VXM boxes together to control two motors at the same time. 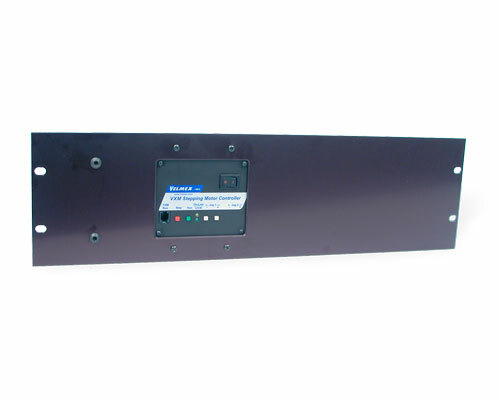 Rack Mount Kit – Mounting kits for stacking and racking multiple VXM Controllers. Available for one or two boxes. 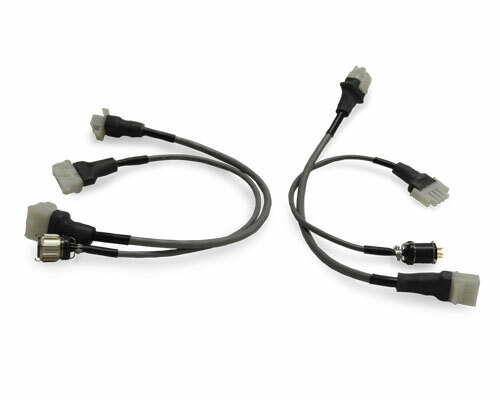 Cable Adapters – Obsolete motor and limit cables and various adapters are available to connect older Velmex products to current Velmex products. 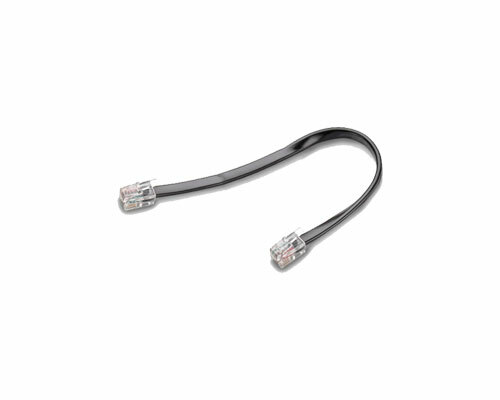 • Serial cables, coordination cables and other lengths of cables. 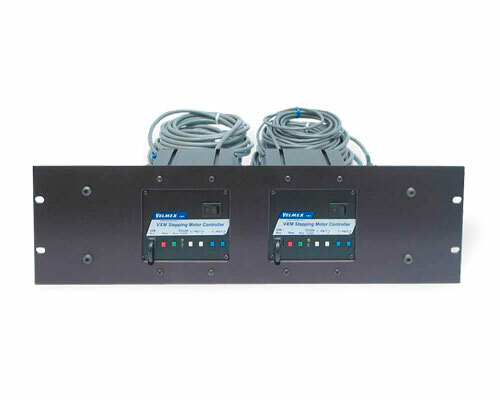 • Mounting Brackets and Plates to connect two VXM Controllers stacked or side by side. For details on Limits which attach to the stages, visit the Limits page. 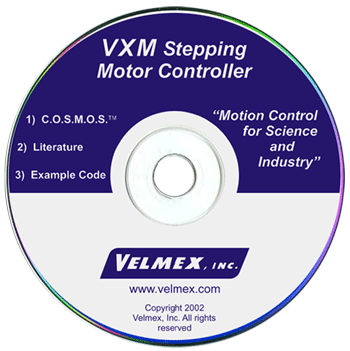 Operating in conjunction with a Velmex VXM™ Motor Controller is C.O.S.M.O.S.™ (Computer Optimized Stepper Motor Operating System). 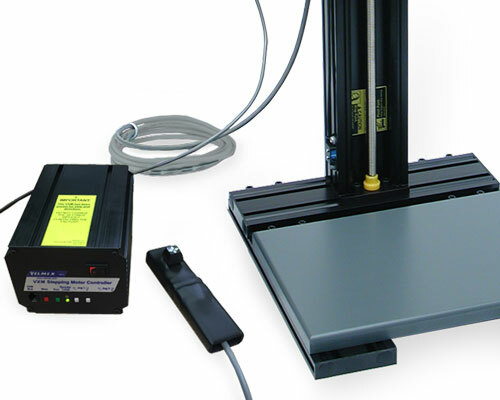 It's a software package with a simple-to-use interface that coordinates communication between the computer, the VXM Controller and ultimately the stepper motor. 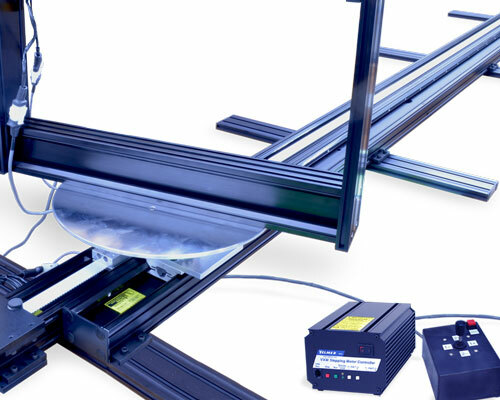 It makes it easy to set-up and program the VXM to control Velmex motorized positioning systems. See Software for more information on COSMOS, along with computer notes, drivers and programming examples. 1.) Basic understanding of the example wanted below is necessary. For .STP files, you may need to right click on the download button and save the "target" or "link". If you require a specific file format or cannot locate the drawing you require, please contact us. Computer Note cosmos_foreign_language.pdf CompNote 101: Using COSMOS with "foreign language"
Computer Note linux_com_protocol.pdf CompNote 102: Communicating with VXM with Linux using "MiniCom"
If you require a different format or cannot located the drawing you require, please contact us. Pictured in our gallery are examples of various controllers in use on Velmex UniSlides®, BiSlides®, XSlides™ and Rotary Tables. Product and accessory offering is subject to change and availability. First - always read the Users Manual. Whenever you have an issue with the VXM Controller controlling the motor(s), check to be sure the system is configured correctly. The VXM needs to be set-up to recognize the specific motor and axis it is controlling. 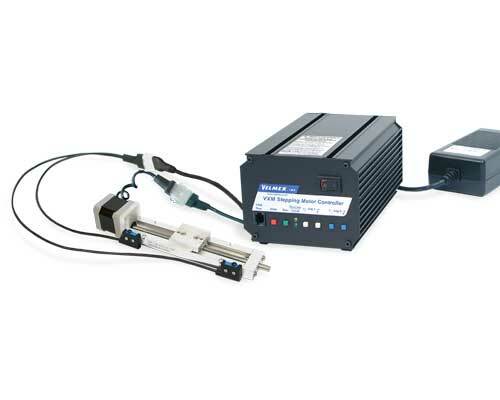 Install and run COSMOS™ Configurator Software to program the VXM to properly operate the connected motors. If the VXM does not appear to be controlling the motors properly, run diagnostics. First run the Serial Port Diagnostics. This will indicate whether or not you are communicating with the VXM Controller. If you are not communicating with the Controller, the system may not be configured correctly or you may have an issue with the communications port. Check both. If the Serial Port Diagnostics runs correctly, but you still have issues, then run the COSMOS Systems Diagnostics. This can help you and Velmex Support, should you contact us, determine what the issue is and how to resolve it. Controller not communicating with computer. If when running diagnostics, the USB cable LEDs do not flash, you could have: a bad connection/cable, wrong USB driver, wrong component/cable. 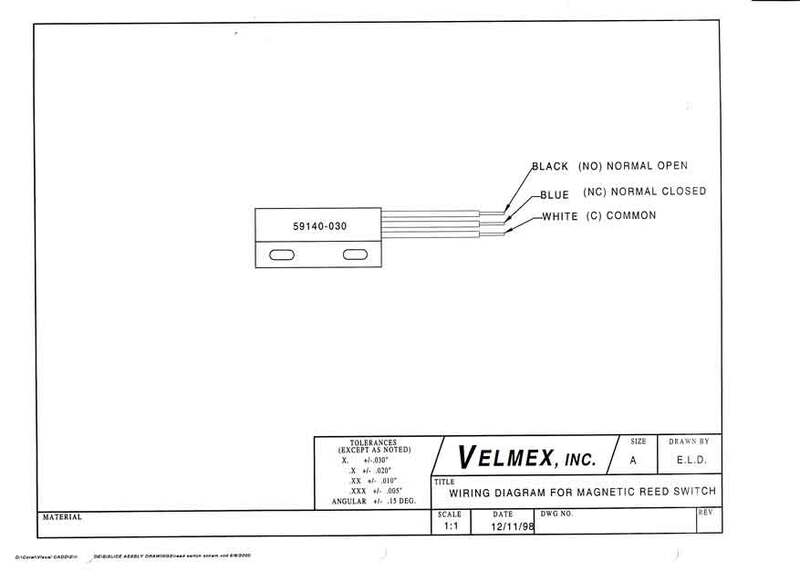 If you have a Velmex RS232 to USB cable, the LEDs will flash when any command, including the diagnostics is sent. Motor makes noise but is not moving (Stalled). VXM not configured for Motor, speed too high, broken wiring, or jammed mechanism/motor. Motor is not making any noise and is not moving (no power to motor). Limit switches not connected or set for wrong type switches. Circuit breaker trips when power applied to VXM. Voltage >28 volts or polarity reversed. Circuit breaker trips while running motor for a short time. Wrong motor selected. Shorted wiring. Circuit breaker trips while running motor for a long time Wrong motor setting. Shorted wiring. Controller overheating from lack of ventilation or ambient temperature too high. Controller is too hot to touch. (It is normal for Controller and Motor do get very warm when running continuously.) Wrong motor setting. Lack of ventilation or ambient temperature too high. NOTE: Motor should always be mounted for heat conduction. Motor runs erratically (at lowest speeds goes either direction, and has low torque at mid speeds). Broken wire to motor or broken connector pin. Motor always goes opposite direction. Directions were inverted with the "setDM" command. Refer to the "getDM" and "setDM" command. VXM resets itself and sends "EB" to the host. A motor 3 or 4 command was sent to the VXM when there is not a second VXM connected to the VXM bus. VXM continuously resets itself (flashes power light slowly) and sends "EB"s to the host. A master VXM attempts communication with a slave that is off. The following are some sound bytes to help troubleshoot motor and controller operation. Is it possible to control more than one axis with the VXM Controller? 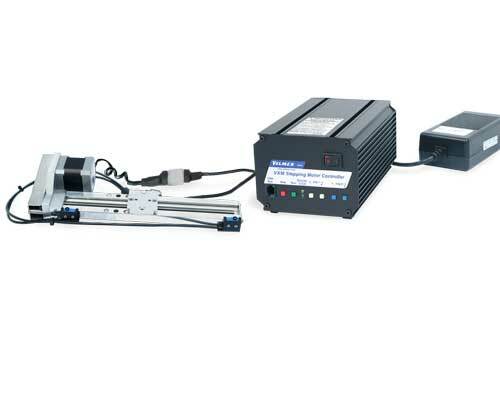 Yes, VXM configurations can control up to 4 motors, 1 motor at a time. 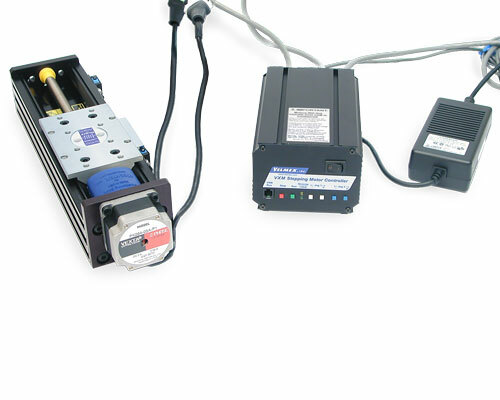 The VXM-4 System can handle 4 motors and consists of 2 linked VXM Boxes. 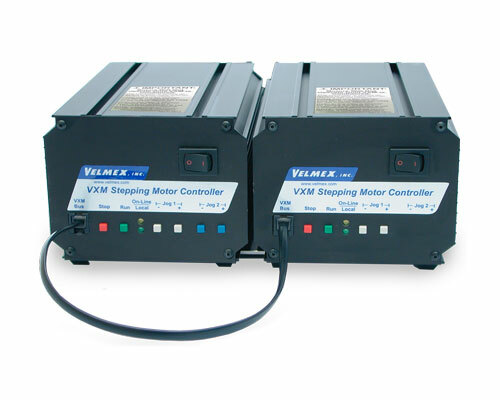 Two motors can also be controlled simultaneously with the VXM1-1. Click on the "Specifications Tab" above for more details and specifications. Is it necessary to connect the VXM Controller to a computer? In order to program the VXM Controller for your specific application, it should be connected to a PC, Laptop, Tablet or PLC. Once downloaded with a program, it can operate without the computer connection. However, the VXM-1J Control has a simple jog and auto-reverse functioning and does not require a computer to program. Will Velmex motorized stages work with other motors and controllers? 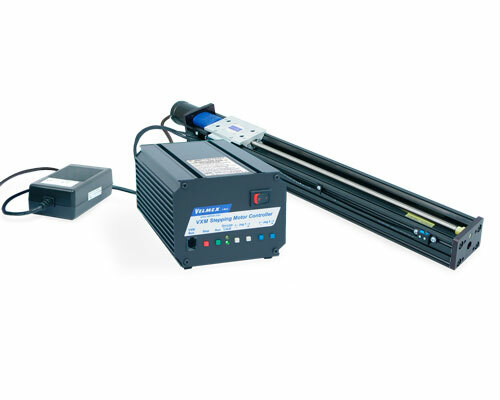 Yes, if you have your own motors and controllers, you can use them with Velmex motor-ready products. 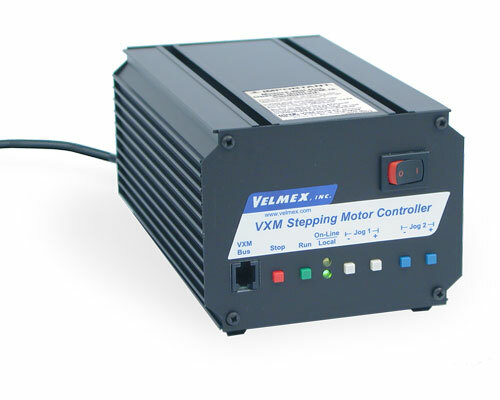 The VXM Controller, however, has been specifically designed to optimize stepper motor control. 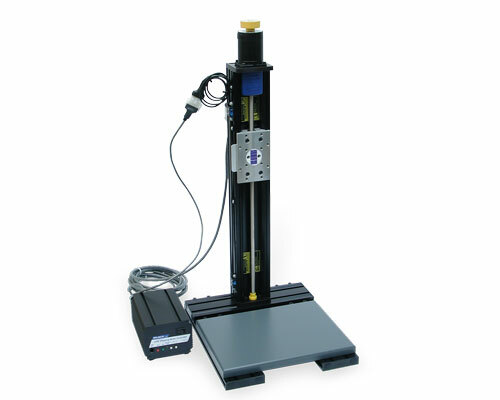 Its a very dependable and low cost solution for high precision positioning requirements. 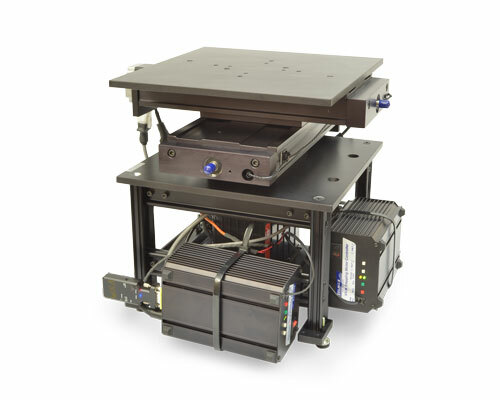 Velmex motorized stages, motors and the VXM Motor Controller come as a complete system, ready to plug in. Click on the "Specifications Tab" above for more details and specifications. I have my motor and the VXM connected, why won't the motor move? Has the VXM driver and the motor been configured? The VXM needs to be set-up to recognize the specific motor and axis it is controlling. If after installation and configuration, the VXM does not appear to be controlling the motors properly, follow the troubleshooting steps in the VXM Users Manual and run the System Diagnostics. Does the stepper motor and/or VXM Controller give any indication it is not running properly? 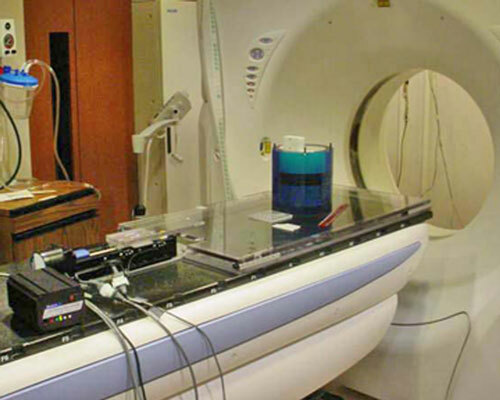 Depending on the situation, the system may sound different than it does under normal operation. See "Troubleshooting above" for sound bytes to help troubleshoot motor and controller operation. What is the default speed of the VXM controller? The default speed of the VXM Controller is 2,000 steps per second. I want to use an Arduino controller. Will it work? It is not recommended. An Arduino cannot generate enough torque to allow the motor to operate within the normal speed ranges. 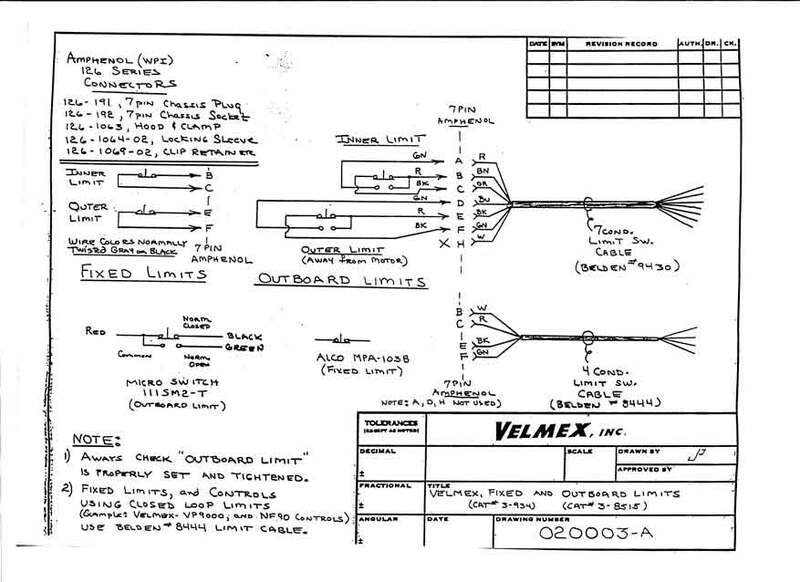 See Limits for information on the use of limit switches. 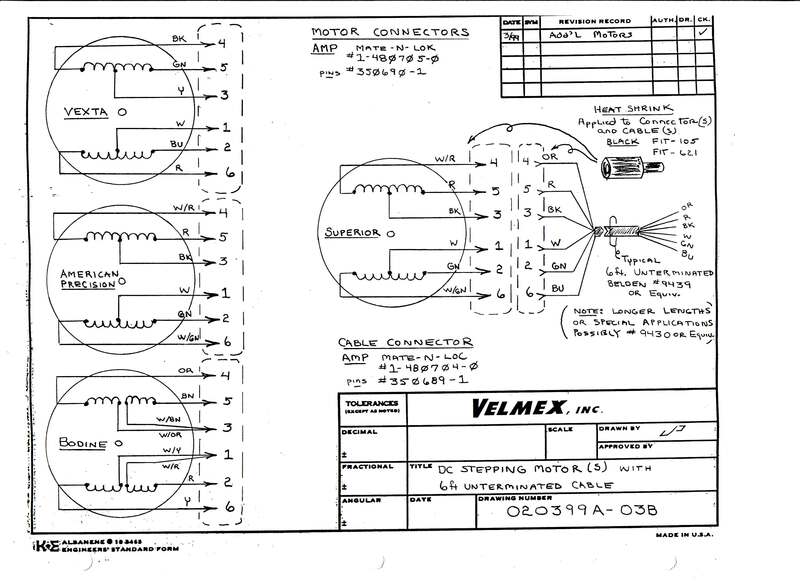 If you have questions about your specific application or want us to design a system using a Velmex VXM Controller, please complete the Request Assistance form or call Velmex to speak to one of our Application Engineers.